FOR the first time in three games, Thirdy Ravena was not gassed out when the final buzzer sounded. No wonder the fourth-year forward was able to play to his full potential. Ravena dropped 14 points, six rebounds, and two assists and, more importantly, drained the dagger trey that lifted Ateneo to the 62-56 Game Three clincher over San Beda in the 2018 Philippine Collegiate Champions League President's Cup semifinals on Saturday. "Ang laking bagay nun. Hindi na kami hingal kabayo sa game because we're complete," he said after the Blue Eagles paraded a full-strength roster in the do-or-die game that determined the finals opponent of University of the Visayas. Academics kept some Ateneo players out of the first two games of the series, but without any classes on Saturday, everyone was available Ynares Sports Arena in Pasig to help the Katipunan ballers get the better of their counterparts from Mendiola. "Nakita natin na San Beda was complete and they were able to keep up with our pace. Medyo shaky kami at the start of the fourth and they were able to catch up, but breaks of the game. 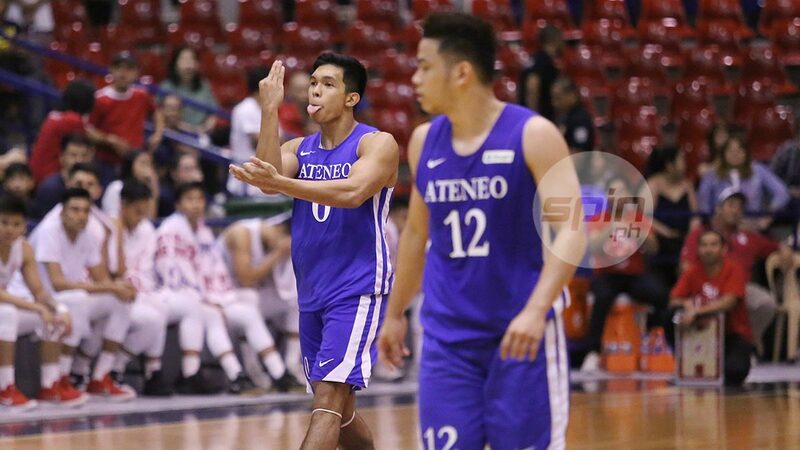 We're lucky na na-pull off pa namin yung panalo despite San Beda's run," said Ravena. The Blue Eagles looked poised to cruise to the easy victory after taking a 41-24 lead in the third, but the champions that they are, the Red Lions made a furious comeback and even tied the game at 55. Ateneo was holding on to a 58-56 lead in the final minute when Ravena sized up James Canlas and drained the game-sealing trey with 22.9 seconds to play. "As a player, gusto ko I will rise up to the challenge, whatever it is. It doesn't necessarily mean that I'll take the shot. It can be a pass or whatever. I just want to be there during crunch time," said Ravena. There's no guarantee that everyone will be available for the Blue Eagles when they meet the Green Lancers in a knockout championship game on Monday at Filoil Flying V Centre in San Juan. But it no longer matters for Ravena. "Bahala na kung kumpleto kami. Ganoon talaga sa basketball, hindi mo alam yung mangyayari and every situation is different. But we'll fight with what we have and tulad nga ng sabi ni coach Tab (Baldwin), we only need five players on the court," he said.